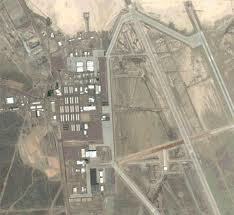 Click here to search the Area 51 page! CHANGE THE VIEW TO SATELITE!!! 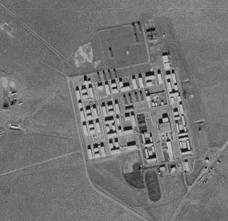 The base lies within the United States Air Force's vast Nevada Test and Training Range (NTTR), formerly called the Nellis Air Force Range (NAFR). Although the facilities at the range are managed by the 99th Air Base Wing at Nellis Air Force Base, the Groom facility appears to be run as an adjunct of the Air Force Flight Test Center (AFFTC) at Edwards Air Force Base in the Mojave Desert, around 186 miles (300 km) southwest of Groom, and as such the base is known as Air Force Flight Test Center (Detachment 3). The facility is not a conventional airbase, as frontline operational units are not normally deployed there. It instead appears to be used for highly classified military/defense Special Access Programs (SAP), which are unacknowledged publicly by the government, military personnel, and defense contractors. Its mission may be to support the development, testing, and training phases for new aircraft weapons systems or research projects. Once these projects have been approved by the United States Air Force or other agencies such as the CIA, and are ready to be announced to the public, operations of the aircraft are then moved to a normal air force base. The intense secrecy surrounding the base, the very existence of which the U.S. government did not even acknowledge until July 14, 2003, has made it the frequent subject of conspiracy theories and a central component to unidentified flying object (UFO) folklore. If you didn't read this at first because you were afraid of the picture, you're an idiot. The cammo dudes also seem to have an affiliation with the Lincoln County Sheriff's Department. The cammo dudes call the sheriff, and the sheriff will take care of you. The cammo dudes themselves are very shy, maybe (but probably not) because they are the people that came out of one of Area 51's failed experiments, and they don't want anyone to see their face. It's probably because they don't want anyone to try to assassinate them, or hurt them while they are in their home. The cammo dudes have helicopters. You can see one of them on the left. They use the helicopters mainly for security purposes, but there have been a number of occasions when the helicopter would harass viewers at the border. It would fly a few feet above the viewers throwing up dust and other debris. This, of course, is not legal, even for a bunch of weird, anonymous, social outcasts that guard government military bases. This is a magnetic sensor. It's in a plastic capsule about six inches long and are buried beside the road. This capsule contains the batteries. A bucket-shaped container contains the transmitter. The wires running off to either side lead to sensors that are buried a few feet apart on the roadside. These sensors transmit signals as someone passes. This makes it impossible to break into Area 51. It could lead to immediate arrest, immediate death, and/or an immediate fine of $600 or more. (If they kill you, they take your wallet). Every secret military base has to have a gaurd shack. If you were expecting tall steel walls, tall towers with machine-gun cannons on top, security cameras, helicopters, radar dishes, lots of security gaurds parading around with high-tech gear, you're wrong. This gaurd shack looks like something a hermit might live in. It doesn't do much either, except be a place where the cammo dudes can hang out. You can go up to the gaurd shack, but then you would be fined $600. This picture was probably taken by someone who ignored the warning signs and drove up to it. This may sound a little wild, but some people believe that when an alien spacecraft crashed in Roswell, N.M. -- if, in fact, it really did -- the government sent the wreckage and the body of an alien almost 900 miles (1,448 kilometers) away to Area 51 near Las Vegas, Nev., to be examined. 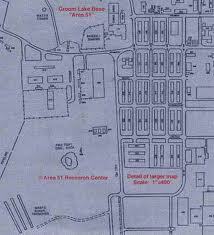 Some people even say that warehouses of alien technology and living aliens can be found in the tunnels and facilities underneath the visible buildings of Area 51. There are even some people who believe that the aliens are in charge at the site and are trying to come up with a human-alien hybrid because they can't reproduce themselves. Some think the government allows these aliens to abduct people freely for various experiments. The Air Force has denied any connection between aliens and Area 51. 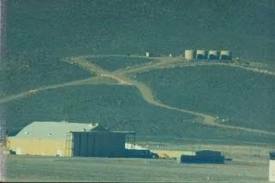 Despite Air Force denial, however, conspiracy theorists still maintain that Area 51 is connected to aliens. In 1987, Robert Lazar claimed that the government was holding nine alien spacecraft near Area 51, and that he was helping them adapt technology from the aircraft to help power military equipment. According to Lazar, he discovered a special substance called "Element 115" that powered the alien ships. Most believe Lazar's claims to be false, but since he appeared on television making these statements in the late '80s, he inspired new public interest in the idea of aliens at Area 51. The government has used the airspace around Area 51 for test flights over the years, and many people have reported seeing UFOs in the area. However, many of the government's test aircraft in the past may have looked strange, causing people to think they were seeing something other than Earthly craft. 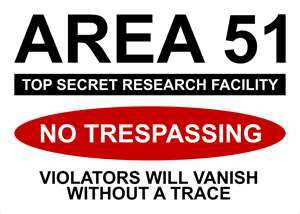 Check Out Our New Area 51 Security Manual!